For Catarina de San Juan also known as China Poblana, see Catarina de San Juan. 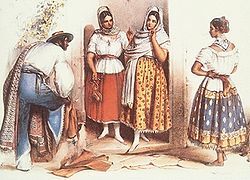 Poblanas (women of Puebla), in a 19th-century vignette. To the left appears a chinaco. China poblana (Pueblan Woman) is considered the traditional style of dress of women in Mexico, although in reality it only belonged to some urban zones in the middle and southeast of the country, before its disappearance in the second half of the 19th century. —  La china. José María Rivera. "La china" woman, in a lithography that accompanied the heading of the same name in the book Los mexicanos pintados por sí mismos about the milieu of Mexican culture. The fashion design of the china poblana dress is attributed to Catarina de San Juan, although it certainly incorporates elements from the diverse cultures that were mixed in New Spain during three centuries of Spanish rule. A white blouse, with fringing and embroiderywork of silk and beads, in geometric and floral designs in bright colors. 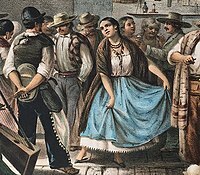 The blouse was sufficiently low-cut to allow part of the neck and the bosom to be seen, which scandalized to no end the "proper" women of nineteenth century Mexican society. A skirt called castor (or, "beaver"), named after the material it was made from. According to some historians, castor was used by well-heeled ladies of the household to make the underskirts of their indigenous maids. The castor skirt was decorated with sequins and camarones (literally, shrimp) that formed geometric and floral shapes. Folkloric dance groups have revived a version that has the coat of arms of Mexico embroidered with sequins, beads, and bugles (a type of bead). A white slip with enchilada stitching, that is to say with the lower hem criss-crossed with zig-zagged lacework. The slip of a china poblana would peek out under the castor skirt, and served to keep the form of a woman attired in the china dress from showing in silhouette. A loop that held up the castor and the slip to the waist of the woman who wore it. The loop may or may not have been adorned with emroidery, or woven in brocade-style. A shawl, sometimes made fine with silk, or in most cases with bobbles. The shawl is a very common garment in Mexico, even today. Women use it to cover themselves from the cold, but it was also used to carry babies or any other thing that was difficult to carry barehanded due to size and weight. The bobble shawl, which was most commonly used in china dresses, was woven with threads of blue and white color, and originated in the Otomí town of Santa María del Río (San Luis Potosí). In some instances, the china was accompanied with a scarf or kerchief of silk to hide any cleavage that might peek out of the blouse. Of these scarves, José María Rivera wrote that "these regularly come home on Sunday only to return to the pawn shop on Monday or Tuesday". As footwear, 19th century author Manuel Payno pointed out that despite her financial lackings, a china-dress woman would use satin shoes embroidered with silk thread. This type of footwear appears in some nineteenth century Mexican texts as an indicator that the wearer was a "merry woman". Furthermore, the china wearer completed the outfit with beads and jewels that adorned her ears, her cleavage, and her hands. A Mexican fandango from the 19th century. In the image a china woman can be seen dancing with her characteristic fine attire, to the sound of a harp. A stereotype of a person is loaded with strong insinuations that imply that a person that belongs to a certain class should act a certain way. The "typical" china woman is no exception. As some authors have observed about Mexican women in general, in Mexican culture "there is no place for a woman that is not a saint or a prostitute." But in the case of the china women, it is necessary to point out that their reputation fluctuated between positive and negative extremes, and in some cases, the very incarnation of a good woman or an indecent woman, depending on the beholder. —  Rivera, José María, Ibid., p. 32. In that sense, the wardrobe of the china woman was considered too provocative. Contemporary Mexican journalists and foreigners who knew these women in the first half of the nineteenth century call attention to the way in which the fashion of peasant women showed off their feminine forms, or were an appropriate feature of all the graces that were attributed to these women. A verbal portrait was made of them as excellent dancers of jarabe music popular in that era—like El Atole, El Agualulco, El Palomo and others that form part of the folkloric jarabes of the twentieth century—, also as models of cleanliness and order; of fidelity to "their man" although also seen as very liberal sexually. Not that much is known about the China Poblana mostly because many know it but there is no actual evidence saying that she did in fact exist. And there for many people argue that because if this it might just be a legend. One thing to keep in mind is that no one had writing utensils and no television and therefore to pass the time they told stories. This is also known as word of mouth and this might just have been one of those stories where it was passed down from generation to generation. ^ Rivera, José María (1997 ): "La china". En Frías y Soto, Hilarión et al. : Los mexicanos pintados por sí mismos. Edited by Rosa Beltrán. Consejo Nacional para la Cultura y las Artes, México, p. 31. ^ a b Rivera, José María (1997 ): "La china". En Frías y Soto, Hilarión et al. : Los mexicanos pintados por sí mismos. Edited by Rosa Beltrán. Consejo Nacional para la Cultura y las Artes, México, p. 36. ^ "El jarabe tapatío", from the website of the Mexican Folkloric Dance Company of Chicago, Retrieved on January 10, 2007. ^ "La china poblana" Archived 2007-02-17 at the Wayback Machine, in México Desconocido. Retrieved on January 10, 2007. ^ "Los rebozos de Santa María del Río" Archived 2007-04-22 at the Wayback Machine, in México Desconocido, Retrieved on January 10, 2007. ^ Vázquez Mantecón, María del Carmen (2000): "La china mexicana, mejor conocida como china poblana". In: Anales del Instituto de Investigaciones Estéticas de la Universidad Nacional Autónoma de México, issue 77, p. 128. ^ Paz, Octavio, ibid., Chapter IV. ^ Bailey, Gauvin A. (1997): "A Mughal Princess in Baroque New Spain. Catarina de San Juan (1606–1688), the china poblana". In: Anales del Instituto de Investigaciones Estéticas de la Universidad Nacional Autónoma de México, núm. 71, pp. 38-39. This page was last edited on 21 March 2019, at 10:47 (UTC).